HDD Regenerator is a little yet powerful program that regenerates bad sectors by magnetic reversal, a hardware-independent technology. It can correct errors that no other repair tool or low-level formatting could. 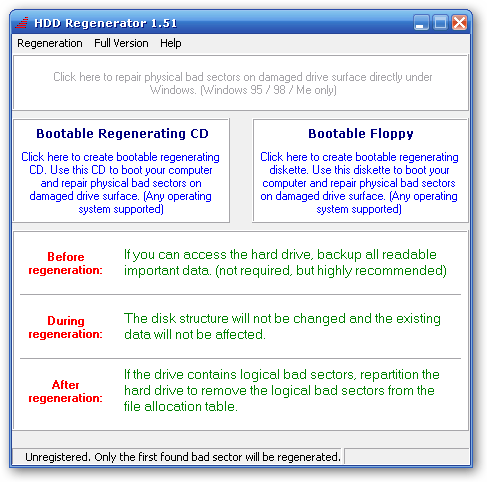 As well as other system tools like Scandisk or CheckDisk, HDD Regenerator restores the bad sectors, so they can be reused again. To hide the existent bad sector marks you will have to re-partition the drive, so they are eliminated from the File Allocation Table. You can use HDD Regenerator no matter the hard disk, operating system, or filesystem. This is because the program works at the physical level, not the logical one. Of course, before starting the regeneration process, you have to make backups of your important data. This is just in case: in a normal process, your data will not be changed in any way. Before using the program, you need to create a Regenerating CD or Floppy disk. This media is bootable and is independent of your installed operating system. After you boot with the media, let the process finish and see the results.